Today I get to share a giveaway from one of my kind and generous sponsors, Green Fairy Quilts. Green Fairy Quilts is run by Judi and Clint Madsen and is an online shop that specializes in Moda and Riley Blake pre-cuts and bundles at great prices. Green Fairly quilts regularly has special deals on various pre-cuts. For example, right now, all Fat Quarter bundles are on sale. This is my newest favorite: Comma by Zen Chic for Moda. Another great feature at Green Fairy Quilts is the option to pre-order pre-cuts and bundles of upcoming collections. The Urban Chicks next collection for Moda, Boho, is another collection I’m looking forward to . Judi is also an INCREDIBLE machine quilter. Seriously, her quilting blows. my. mind. If you’re looking to have your own mind blown, you must visit her blog and check out the amazing work that she does. As a side note, and separate from the shop, Judi and Clint also have an inspiring charity helping in Romania. You can see video of their latest trip there distributing food and donated quilts here. It’s so moving. Judi is always amazingly generous in her giveaways. Today she is giving away a Fat Quarter BUNDLE (that’s 37 Fat Quarters and over $100 value!) of Sandy Gervais’s newest collection for Moda, Snap Pop. Check out those pretty spring colors. Check out Green Fairy Quilts and come back here to tell me something you love in the shop. Giveaway open until Saturday, February 9 at midnight MST. Good luck! I’ve been a fan of Judi’s quilting, and love their shop. Odds and Ends is a favourite line of mine that they carry. Thanks for the giveaway. I subscribe to the Green Fairy Quilts newsletter….I&#39;ve been getting it for over a year now and I love knowing about their new fabrics and sales! I love that new fabric, &quot;glamping&quot; and she has it on sale! I&#39;m all signed up for green fairy quilt&#39;s newsletter! I already get the Green Fairy Quilts newsletter. Thanks for the giveaway. I really love the Indigo Crossings Woven bundle. Thanks for the giveaway. I already follow Judy&#39;s blog. Thanks for the giveaway. Oooooo! Thanks for introducing me to a new (to me) shop! Love her charm packs! I already follow Judy&#39;s blog. Such beautiful machine quilting. I&#39;d like to just sit in the corner and watch her quilting process. I love Green Fairy. I checked her blog often to see her beautiful quilting. I like her patterns, especially Dahlia. Thanks for opportunity. I am a subscriber to Green Fairy Quilts newsletter already and love it. she has soooo many great ones to choose from, I do like cherry on top though. My favorite thing in her store is the thread selection. Mainly because if it&#39;s in their store, she uses it! Again, I dream about quilting the way she does. But getting straight lines is a dinner out celebration in my house! I also follow the blog via my reader. I also get her NL. I follow Judy&#39;s blog, thanks for the giveaway! I love seeing the lines that are coming out in the upcoming months and have ordered them there. I love all the precuts she carries and her prices are great. Love all the pre-cuts in her shop. Thanks for introducing me to another place to shop! I happily follow Judi&#39;s blog. She is AMAZING. I love her work and want to have her mad skills when I grow up. Thanks for the opportunity to have a chance for the give away! Like you, I love that Comma FQ bundle. This is also cute: Moda Layer Cake – Cherry On Top by Keiki. I follow Judi&#39;s blog and swoon over her quilting! I love the blenders in Comma, and the colors in Snap Pop are just great. She has such great fabric in stock! Omg! I would love posy, comma, and any chevron bundle!! I love the Moda Fat Quarter Bundle – Padstow Range by Cabbages &amp; Roses! I love Green Fairy Quilts. I&#39;ve purchased from there a couple of time. She has great prices and sales. I follow her blog. 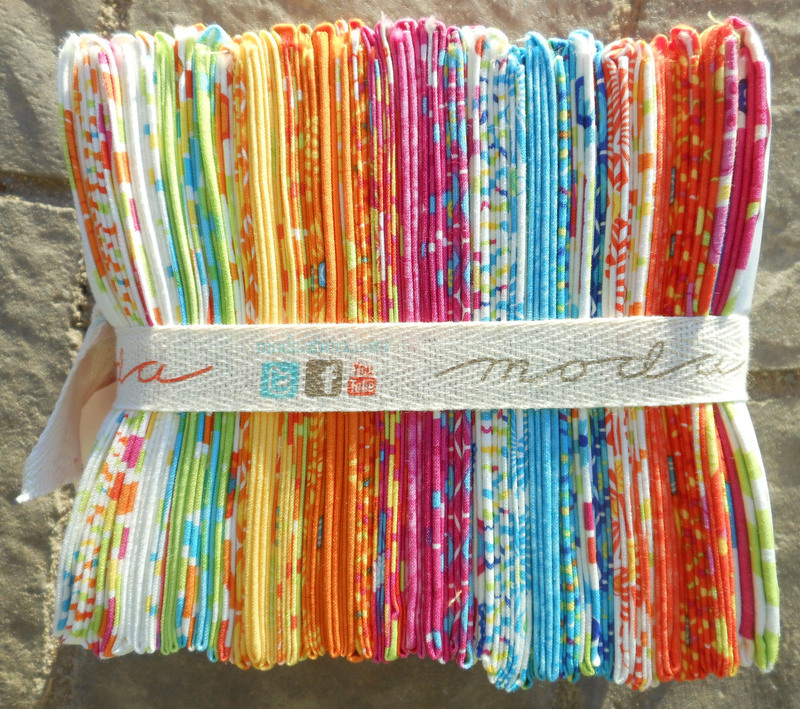 My favorite part of her site is the selection of moda fabrics. I love that she carries Riley Blake goodies as well. My last purchase from her was Odds &amp; Ends. There&#39;s nothing I do not like about her website. I love the ability to pre order on her site. I follow her blog. Her quilting is amazing! I love the Moda Layer Cake – Posy by Aneela Hoey! It is just perfect for a baby blanket project I&#39;ve been meaning to get started on! I began following Judi&#39;s blog on my GoogleReader! Signed up to follow The Green Fairy…. I love the patchwork owl kit. So cute! I already get the newsletter; how could I not? Her prices are wonderful, and when she has a sale on top of those prices! Wow! Lovely service, good folks. Green Fairy Quilts is my absolute go to whenever I want a precut in lieu of yardage – they have great prices and great service. I already subscribe to Judi&#39;s newsletter! I&#39;ve been a follower of Judi&#39;s blog for a long time 🙂 I love her sales on precuts! I also already receive the Green Fairy Quilts newsletter. I&#39;ve been eyeing the Comma jelly roll. I&#39;m making myself finish my current project before I order it though. Now that&#39;s self control, right? And I already follow the GFQ blog! My favorite thing in her shop is the Riley Blake dots design roll. It&#39;s so cute! I love so many things in the Green Fairy Quilts shop… the fat quarter bundle of 2wenty Thr3e by Cosmo Cricket is a sure favourite….! I subscribed to the newsletter and blog. I love the store website – precuts and bundles are my favorite. I love that the Riley Blake collections are in a category all their own! The Jelly Roll and Layer Cake selections are muy bueno over there. :)<br />Ticklish and what I can see of Snap Pop look fun. I love the spring colors~! I love Snap Pop more than any of the new lines. Colors are gorgeous! I already follow her blog, woo hoo!!!!! I can tell you right now I LOVE the $5 shipping fee, no matter what size order! Great perk. Plus all the beautiful pre-cuts. My favorite part of the GF website is her pre-order area. I always know I can go to her for the newest stuff and get it right when it comes out! I dearly love the Comma, by Zen Chick! Thanks for introducing me to a new fabric supplier! I signed up for the newsletter! I love the Comma by Zen Chic FQB! I follow her blog now too! Thank you! Follow her blog – check! Judi&#39;s quilting is absolutely amazing. I&#39;m going to have to read more as I&#39;m intrigued by how she add such dimension to her quilts. I love all of the wee wovens. Especially the aqua and gray print. I receive the newsletter, thanks for the great giveaway! And I subscribed to her newsletter! I love their friendly ready to help attitude! What a wonderful giveaway ! I follow Judi&#39;s blog ! I love the new line Jubilee! I follow Green Fairy Quilts blog! Thanks for the chance to win! 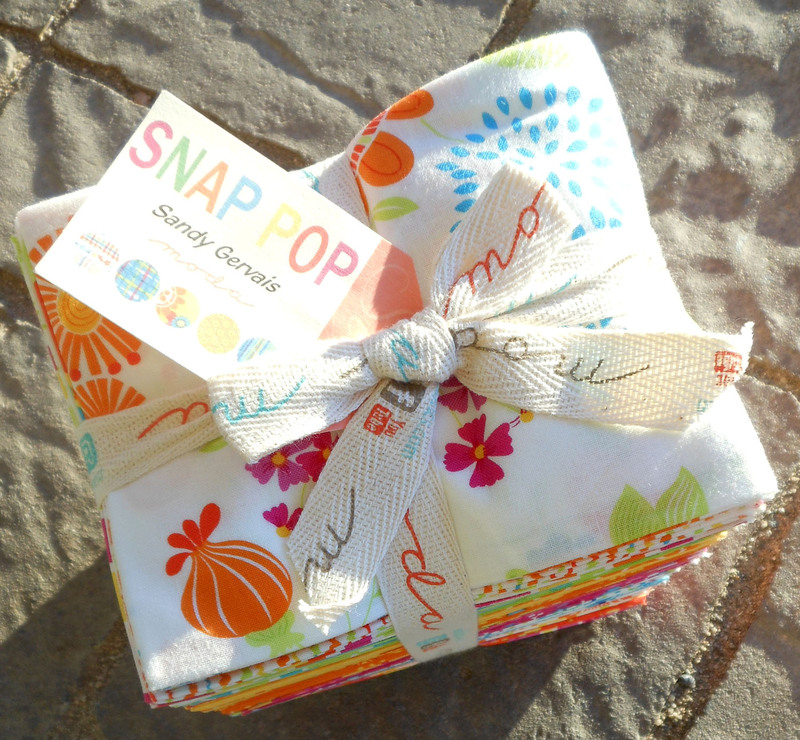 The colors of Snap Pop by Sandy Gervais are very tempting !! I am a newsletter subscriber – love the close-ups of her quilting – amazing! I also follow the GFQ blog. My favorite item in the shop is the FQ bundle of Comma!! Loving the &quot;Mod Century&quot; fat quarter pack. I could see lots of pillows in my future. I follow Judi&#39;s blog. Thanks for the giveaway. Love the new line 2wenty thr3e. Thanks for a great giveaway. I follow her blog. She does amazing work and has a great fabric selection. I love the Bella solid charm packs … they are just perfect for making quick HST! The fabric that I thought was sew beautiful was the Spring House fat quarter bundle by Moda! And I already follow the Green Fairy Quilts blog! Comma is one of my favorites too! I am a blog follower also! I have followed Judi&#39;s blog! Can&#39;t wait to read it!! I love the 2twenty Thr3e fat quarter bundle! And the Snap Pop bundle is really gorgeous, too! I already subscribe to her awesome newsletter! I love all the charm packs she offers on her website! I get the newsletter. Thanks for the chance! I follow the Green Fairy blog. Thanks for the chance. I get their newsletter. Love their stuff! I follow her blog….and thanks for the chance!!!! I get their newsletter. They put their fat quarter sets on sale way too often for my budget! Thanks for the chance to win. Happy Wednesday to you. I love the Riley Blake fabrics – especially the Bohemian Festival &amp; Indie Chics. I subscribed to Green Fairy Quilts newsletter a long time ago. I am loving the Over the Rainbow Batiks charm packs. Officially following Green Fairy Quilts blog now ~ but have been following unofficially for who knows how long. L.o.v.e. Judi&#39;s fabulous quilting! Just became a follower of her blog. (before I was just an occasional checker of her blog so thanks for the push!) She is so talented. Tough to pick only one &#39;cause there are so many! Guess I&#39;d have to say Comma by Zen Chic. I love love love Comma by zen chic. I loved the Wee Woven Brights. Such a great way to accent with a pop of color. I signed up to follow Judi&#39;s blog…WOW AMAZING quilts!!!!!! I have subscribed to the newsletter. Thanks for the chance! What a super shop! I really love the Oh Deer fat quarter bundle. I made a quilt with two charm packs and I just love the bright colors in that collection. I love the shop but the history of quilting and the quotes are what make it a cool place to just wander around for me! I subscribed to the Green Fairy Quilts newsletter!! I love all the new lines of fabric on her website!! I would drop dead if I won your giveaway! I&#39;m a huge Green Fairy Quilts fan and have ordered from there too many times. I&#39;m a subscriber to the newsletter. I love the Bungle Jungle fat quarter bundle. I love the Green Fairy Quilts always offers the Bella Solids pre-cuts. Generous is not the word- wow- how exciting!! I am now a follower of her blog! Thanks! I follow the blog! What a great site. I am drooling over Wee Wovens brights!!! I follow her blog on google reader! I really love the fat quarter collection by 2wenty thr3e . . . makes me want to sew! I&#39;ve been a fan of Judi&#39;s quilting, and love their shop. Odds and Ends is a favourite line of mine that they carry. Thanks for the giveaway. I love how she is always up to date with the current fabrics. My favorite in her shop right now are Posy and of course- Snap Pop!! Love the colors and makes me happy just looking at them! Thanks! I have subscribed to the newsletter too- fingers crossed for winning this awesome prize! I love being able to pre order pre cuts! And the customer service is the best. Awesome giveaway! I love Judi&#39;s shop. I like the kissing booth layer cake. And I get the Green Fairy newsletter too! just checked out Green Fairy Quilts and loooove the oh lala girls and boys prints. Adorable! I subscribe to their newsletter. Thanks! I love the Moda Jelly Roll – Posy by Aneela Hoey!! I already signed up for the newsletter! I&#39;m subscriberd to Green Fairy Quilt&#39;s newsletter. I love the Get a Clue Nancy Drew fat quarter bundle. Love the 2wenty Thr3e! Thanks for the lovely giveaway! What an amazing giveaway. Thank you! I have my fingers crossed. I get the GFQ newsletter. And I follow the blog. Wow, that quilting does blow the mind! I followed her blog! I&#39;m a blog follower too! 🙂 Love their charity outreach! I like the Northcote range by Cabbages and Roses! Recebo boletim fada verde,e sigo seu blog também. I just signed up to follow her blog – I&#39;m in awe of her longarm quilting! I love the owl quilt kit! Sou seguidora de fada verde. I need to get my hands on some of that Posy and Comma! One adorable, the other modern! I am on their mailing list. I love their special offers. The Comma is my favorite-seriously!! Love the &quot;Posy&quot; layer cake (or any set of that fabric)… I think it would make a sweet quilt for my little girl when she moves up to a big girl bed. Well, the owl quilt is pretty amazing! I&#39;ve been following Judi&#39;s blog for some time now (her skills are unbelievable!! ), but now it&#39;s official! I am subscribed ti Green Fairy Quilts. I already subscribe to the Green Fairy Quilts newsletter. Thanks for the chance at a giveaway!! I follow Green Fairy Quilts in my Google reader. I love the selection of pre-cuts at Green Fairy Quilts! I love the new Cosmo Cricket line, 2wenty Thr3e! Yay I get the newsletter! What a great giveaway – I&#39;m drooling! Right at trhe moment I like the Jubilee line best.<br />It&#39;s just… gracious. What a fabulous giveaway! I follow Green Fairy Quilts blog – yay! I love the Indigo Crossings precuts. Such pretty blues. I already follow Green Fairy Quilts and the Romania video really is so touching. I love the Moda Layer Cake – Welcome To Bear Country by Moda. It brings back memories of reading the books to my kids when they were little. I would love to make a quilt out of it for when one of them gets married and has a child of their own. Love all the colorful fabrics. I&#39;ll hopefully be starting a quilt for my daughter soon. That Moda Fat Quarter Posy bundle looks so sweet. I already am signed up for Green Fairy&#39;s newsletter. I love the 2wentry 3hree bundle – what fun! Super giveaway – thanks for the chance! I love the Jubilee fat quarter set! I love the Country Picnic quilt pattern! Actually I love it ALL!!!!! Now following the Green Fairy blog too! I already follow her blog and agree she is one of my favorite longarm quilters that I am blown away by her talent and her continued desire to do these tedious designs. I get the GFQ newsletter! I&#39;m looking forward to the Simple Marks Summer line coming out – looks like Green Fairy Quilts will get lots of their precut bundles in April! I happily receive their newsletter! Thanks for the great giveaway! I signed up for Green Fairy Quilt&#39;s newsletter! I cant pick just one…but I love the the Jelly rolls A lot! I like Comma and 2wenty Thr3e! I&#39;m a big layer cake girl…both confectionery and fabric…and I&#39;m lovin&#39; their Mod Century by Jenn Ski. I think there may be a cute quilt in my future with those pretty squares! I subscribed to Judi&#39;s newsletter. Done, Done, and Done! I am a huge fan of the $5.00 shipping! And I follow her blog! She is an amazing quilter – you are absolutely right – it is mind-blowing! I&#39;d love to pick up what&#39;s left of those Honey Honey precuts 🙂 I wish the FQ bundle was still in stock! I love the Bear Country fat quarter bundle! It would make the cutest quilt ever! I follow their blog. I&#39;ve been a great fan of theirs. They have great sale prices. I get the GFQ newsletter. THanks to Judi for the generous giveaway! I love sentiments by 3 sisters, the layer cake would look sew good in my hands. Posy is my favorite bundle right now! I&#39;ve been getting their newsletter for about a year now. I follow GFQ blog. Loved that video! I have been getting the newsletter for some time. I didn&#39;t know she had a blog, so I&#39;m now following it. Thanks! I love the Moda Enchanted Pond jelly roll. It would make the perfect quilt for my bedroom. I follow via email. Great blog! Moda Fat Quarter Bundle – 2wenty Thr3e by Cosmo Cricket is awesome! Love Green Fairy&#39;s quilts!! Following their blog! I love the Jelly Rolls, especially the Posy by Aneela Hoey! I signed up for the Green Fairy newsletter!! and to be honest, i love pretty much any fabric, especially moda. love bonnie and camille. but also love some of the solids/neutrals. <br />thank you for this chance! I follow Green Fairy&#39;s blog through Google Reader. I love 2wenty thr3e. Thanks for the chance! Judi&#39;s quilting is amazing. A true artist. I already receive their newsletter. Layer Cake of Mod Century by Jenn Ski is one of my favorite items in the shop. I love following her blog. I am now following Green Fairy Quilts and her Blog. As a very new Quilt maker ( am trying to make my second quilt at the moment) I love the creative patterns in her shop. Would love to win this to start my supply of Moda material. And I already follow her blog in my reader. I love Sakura Park! And I&#39;d not heard of Green Fairy Quilts, so thank you! I love the Moda quilt kits on the Green Fairy Quilts page. I subscribed to Green Fairy newsletter! Love the little patchwork owl quilt 🙂 Already follow her awesome blog! 🙂 Thanks for the chance. Loving on the Bella solids in the shop! Ohhh I loveeee the glamping bundle!!!!!!!!! I subscribed to the Green Fairy Quilts blog. Favorite would be all the Kissing Booth precuts. Following the blog. You weren&#39;t kidding, her work is jaw-dropping!! I like the oink a doodle moo line. I started following the Green Fairy Quilts blog. 3. I am now a new follower of their blog, thanks for hosting the giveaway. Lovely. So happy to find a new fabric shop! I love fat quarter bundles and their prices are very reasonable! I am following her bloc now! I&#39;m loving the Comma bundle – or Paris Flea Market. I currently receive their newsletter! I Subscribe :)<br /><br />Thank you! Oh, how I LOVE Moda! Really into the charm packs right now for making mug rugs and Green Fairy Quilts has so many adorable packs to choose from…and they are on sale!!! I&#39;ve always loved Green Fairy Quilts. I signed up for their newsletter. So many things in the shop that grab my attention. Just starting to have an interest in wool for applique on quilts so it is good to see a range of needle punched wools. They are not always the easiest to find.<br /><br />Thank you for such a fantastic giveaway. I visited their shop and love the new twenty three collection! Its hard to pick just one things I like, there are so many. I am currently in love with &quot;Comma&quot;….great fabric line! I follow everyday and love everything she has to offer. I subscripe to Green Fairy Quilt newsletter, I love them! Thanks for the chance at a wonderful giveaway by a wonderful sponsor! I don&#39;t think I&#39;ve every seen machine quilting done that beautifully. It is indeed a masterpiece. I visited the Green Fairy website and fell in love with one of the quilt patterns–Garden Party Quilt. I&#39;m off to order it now. I love that Green Fairy Quilts offers the chance to preorder future lines! Love that you know what is coming and when. I seriously want that Comma fat quarter stack! I follow Judi&#39;s blog and I am truly amazed at her quilting, just WOW! I follow the GFQ blog. I&#39;ve signed up for the newsletter! I&#39;ve also added the blog to my blog feed! Love the Color Splash Batiks! (And I especially love her red, brown &amp; tan quilt that you show here, wow!). I receive the Green Fairy Newsletter – thank you! I follow the Green Fairy Blog – thank you so much! And, I&#39;ve been following her blog for a long time now! I love Green Fairy Quilts – I was just checking out their sales – I love their Little Apples FQ bundle! I already get the newsletter, as I am a satisfied costumer of theirs. So many great things! I loved the Moda Jelly Roll – Spring House by Stephanie Ryan!!!!!!!! Pick me pick me! I have been a subscriber to their newsletter for a while now . I am a follower of Green Fairy Blog. Thanks for the chance to win these lovely fabrics . What a fun giveaway! I visited the website and found the Prisma Cats. SO CUTE!!! Thanks for the giveaway! I love just about everything in her shop. I REALLY like the Christmas Spirit Brushed, Sentiments by 3 Sisters, Peak Hour, and On the Go! I follow Judi&#39;s blog and I love it. Her quilting is insane. Thanks! I love the Comma and Posy they carry. Thanks!! I&#39;ve been getting their newsletter for a while. Thanks!! Just signed up for the newsletter and read through her blog. What beautiful work she does! I love the colors in the give-away bundle! I didn&#39;t know about dessert rolls until I just looked at the Green Fairy website. I think I&#39;d like to try one of those. I love charm packs and being able to cut more 5&quot; squares of matching fabric. I love the selection of pre-cuts she has at her store! I already receive the Green Fairy Newsletter! I LOVE pre-cuts and have ordered them from Green Fairy before. Quick service and great prices! I already get the Green Fairy newsletter. I love Comma and already ordered a fat quarter bundle, but I haven&#39;t decided what I will do with it yet. I also follow Green Fairy&#39;s blog and love seeing all of the beautiful quilts she does! Thank you for the giveaway! I just checked the website and one of my favourite fabric lines is Cherry on Top. I think I need a bundle. I love the great selection of precuts! I&#39;ve received the Green Fairy Quilts newsletter for quite some time now! My favorites would have to be Prisma Cats and Apple Jacks. I love stripes and checks so I&#39;m quite taken with Wee Woven Brights by Moda. I&#39;ve just subscribed to the news letter. Everything in the shop is beautiful! I love all of the fabric and all of the patterns too! I love all of the pretty fabric and all of the patterns too. I subscribed to GFQ newsletter. I love Moda, so this site is awesome for me. I really love the Snap Pop design from the giveaway, and I also like the &quot;twenty three&quot; fabric, too. Thanks for the giveaway! I love the 23 line! I have been following the blog for a while and I am receiving the newsletter. Love Green Fairy Quilts. They have great sales. I&#39;ve been a subscriber to their newsletter for quite awhile. officially a newsletter subscriber now at Green Fairy – not just saved in favorites anymore! I think awhile back you talked about Green Fairy quilts on your blog and that is when I went over and discovered their cut little corner of the internet. Such a fun and great place to find fantastic deals on fantastic product! I am already a subscriber and follower so thanks for the chance to win! Love that Cherry on Top layer cake…and it&#39;s even on sale…oooh. I follow the GF blog! I follow GFQ blog.. thanks for a chance in this great giveaway!! I love the small chevrons bundle! Love that you can pre-order pre cuts like the amazing Happy go lucky precuts for May. Those pre-cut Hexies are great. Love all the bundles on sale!! off to shop! I am following Judi&#39;s blog through google reader. What an amazing Dear Jane post. I LOVE Judi&#39;s shop. Following the blog. my favorite thing about Judi&#39;s shop is the pre-order feature! I&#39;ve already pre-ordered Camille&#39;s Happy Go Lucky FQ bundle and I can&#39;t wait for it to get here…in three months! Yes, in total agreement with you about Green Fairy Quilts. I&#39;ve placed many orders with them and have never been disappointed. I follow their blog. Been getting the newsletter for months. I already subscribe to the Green Fair Quilts newsletter. Thanks so much for the giveaway. Love the Comma by Zen Chic, and I signed up to follow her blog! At Judi&#39;s site I like the variety of FQ&#39;s she has.I am also AMAZED at the talent of this Lady.Her quilting is beyond words. Judi has some great patterns in her shop like All Boxed Up and Butterfly Mania! Talk about a talented woman! That&#39;s Judi! Ive subscribed to the newsletter! Thanks for another great giveaway! Hard choice but I love FQ bundles and my favourite is the Cherry on Top bundle! I love Cinnamon Spice by Blackbird Designs…the fat quarter bundle. I follow Judi&#39;s blog too! Too hard to choose only one.I love the precuts area and Odds and ends are one of my favorite. I already follow Judy&#39;s blog. Thanks! I already get the Green Fairy Quilts newsletter. Thanks for the giveaway!! I follow her blog-she is amazing!!! I get her newsletter, too. I have subscribed, started following and my goodness I love everything in the shop! Wow. I also like the Cherry on Top fat quarter bundle! I am in love with Simple Marks! I love the Cherry on Top FQ bundle by Keiki! Wow, what a great giveaway! I love Judi&#39;s shop because of the variety of fabrics that she has. From solids to beautiful prints and wool, there&#39;s always something she has, that I want. Thank you. I subscribe to the newsletter. This is one super great prize! I love the prices! My money would go further at Green Fairy. I also love the Glamping range they stock in so many different cuts. I&#39;m liking Posy and Snap Pop. I also love she makes it so easy to see the upcoming lines! I&#39;m also a follower of the blog! Love anything of Simply Color! I have been a longtime follower of Judi&#39;s blog~ love her quilting!! I already subscribe to her newsletter. 🙂 LOVE her blog and shop!!! I love their shop! It is so fun to see new lines coming out before they hit the stores. And she has excellent deals. Thanks for the fun! i&#39;ve been drooling after the Comma line since i first saw it. AHHH!!! yes, i subscribe to the newsletter 🙂 BECAUSE THEY&#39;RE AWESOME! Green Fairy is one of my favorite blogs to read – so of course i follow her. I&#39;m not crazy! I&#39;m already a follower of her blog. Her quilting makes me swoon. I think her shop is layed out so that it is easy to navigate to what ever you are shopping for. I have ordered from her on several occasions and my order always comes quickly and the prices are SUPER!!! I subscribe to Green Fairy Quilts already. I love their blog and their store, I am a faithful shopper there. And I am coveting the &#39;2wenty Thr3e&#39; FQ bundle! They have so much to love in their shop. A couple of my favorites are Indie Chic and Comma. It&#39;s a toss up for what I like best in her shop! I love, love, love the owl quilt. I also am in love with Jubilee and Spring House. Her quilting templates are also wonderful!!! What to choose????? I would love to have a bundle of Twenty-Three, it is so awesome. I subscribe to Green Fairly Quilts newsletters! I follow the Green Fairy Quilts blog on my google reader! The new line &quot;oink a doodle moo&quot; is so cute. I have bought many precuts from Green Fairy Quilts and they are awesome! I love seeing all the new fabric lines that are coming out. I also check the sale section regularly. I love Moda&#39;s Dancing in the Rain Batik Bundle. thanks for the Giveaway! Subscribed! That bundle is luscious, and it&#39;s giving me pangs for springtime!! i just signed up to follow her blog. What a great discovery! Thanks for the introduction. I follow the Green Fairy blog. I like Enchanted Pond. There are some lovely fabrics in the shop. I subscribed to the newsletter. I can&#39;t wait to see what&#39;s new. There are so many great things at Judi&#39;s shop! Right now, I am loving the Spring House layer cake!<br />Thanks so much to Judi for the generous giveaway. Love Green Fairy Quilts. The Moda fabrics are my favorite. The site is great. I like the spring house patterned fabric on her site. I already get their newsletter. Thank you for the chance. I would like some sew stitchy or hmmm, it&#39;s so hard to decide. I want it all. I love the Paris Flea Market! Thanks for the giveaway. I am a subscriber to Green Fairy Quilt&#39;s newsletter. Thanks for the giveaway! And I follow her blog – her quilting is spectacular! I follow her blog. Her quilting is truly amazing! I like so many things about Green Fairy Quilts! I love their $5 shipping fee. I love their FAST shipping! I love the great variety of pre-cuts they have! I subscribe to her newsletter already! My favorite thing in the shop is the Double Chocolate quilt kit!! I love Comma and Twenty-Three! I am so glad I saw this because I just fell in love with Green Fairy Quilts ! And I did just subscribe to the blog ! I also subscribed to the newsletter ! AND ! I love love LOVE the Independence Trail wool bundles ! I have been contemplating a wool quilt actually recently and when I saw that I got some amazing ideas !! Absolutely love her shop! Did y&#39;all get a look at all of the Moda pre-cuts she has coming in this Spring? Definitely need to order some. Just beautiful! I follow the blog on blogger! I subscribe to Green Fair Quilts newsletter. Love, love, love Noteworthy by Sweetwater! The colours in the Over the Rainbow Jelly Rolls are just devine! I love Green Fairy Quilts and I am in need of some solids, the &quot;dill&quot; looked great. I am a follower of Judi. i&#39;ve been getting the greenfairies newsletter for quite awhile now. Oh, and I subscribe to the newsletter. love the green fairy shop for all the advantages … great selections, good prices, great sales, fast service are some of the good things about the shop that i like. I love the Moda Layer Cake – Bear Country School. I LOVE Berenstain bears!!!! Wow, I’ve never come across Green Fairy Quilts before, but I love it all! I love the Comma FQ bundle! I get the newsletter. Beautiful collection. and now I am signed up to get the newsletter! wonderful! I follow Green Fairy Quilts. I am in awe of her talent and they have some of the best customer service in the business. Love the layer cakes…especially Comma and twenty three. Might just be my fave precut. I am a subscriber!<br />Thanks for the giveaway! This was my first visit to Green Fairy– I was in fabric bundle heaven! Great site.<br />I&#39;m loving the Comma collection! I already follow Green fairy Quilts! I love the Moda Snow day Batiks ! I love that you can pre-order precuts. I really like Avalon that will be out next month! I follow her blog. Thanks for a chance to win such a fun and generous prize! Fingers crossed! I already follow Green Fairy Quilts!! I subscribe to the newsletter and love getting updates! I joined the newsletter group. Just checked out Green Fairy Quilt shop and there are some great bundles there! I love the owl pattern and wish I&#39;d seen it when I was making baby quilts for friends this past fall! Thanks for the chance to win! I follow the blog and what fun that is! I already get the newsletter, but I am now following Judi&#39;s blog. What amazing talent! love the ocean view fabrics!! Geez, it&#39;s a tie between Wee Wovens, and Comma! And I really love the brights in the bundle up for grabs this week. Generous of Green Fairy Quilts! I am really loving Winter&#39;s Lane, which doesn&#39;t come out yet, but is oh so pretty! I love that patchwork owl kit that they offer. I receive Green Fairy Quilts&#39; newsletter! And I follow her blog too! At the moment I am loving Moda Fat Quarter Bundle – Ticklish by Me &amp; My Sister Designs. Thanks for the chance!! I already get Green Fairy Newsletter!! Thanks for another chance!! I am already following Green Fairy blog via GFC! Thanks!! I love all of the fat quarter bundles! Glamping by Mary Jane is really cute! I&#39;ve signed up for the Green Fairy newsletter! Oh this is wonderful. I&#39;m a follower. Love, love her long arm quilting! Subscribed to the newsletter, looking forward to it! I get Green Fairy Quilts newsletter – so does my husband! Now following her blog, thanks for the suggestions! I know the intention was to talk about a product at the GF shop that we like…but I can&#39;t help but comment on the prices! THATS what I like in the shop! I LOVE &quot;Oh Deer&quot; by MoMo, it&#39;s so pretty and fun! I follow Judi&#39;s blog. Love her quilting style. I receive Green Fairy Quilt&#39;s newsletter. Thanks. I love the Blackbird Designs&#39; Field Notes!! I subscribed to the Green Fairy Blog!! I&#39;m signed-up for the Green Fairy newsletter. I love the Prisma Cats – gorgeous bright vibrant colours. I am a very happy blog follower. I am a subscriber to the newsletter, too! I love the 2wenty Thr3e collections. I&#39;m a fan and I love Glamping charm pack the best. What a fun project that fabric would make. Thanks! I am a current subscriber to the Green Fairy Quilts newsletter. I love the Honey Honey Charm Pack! I really like 2wenty thr3e it&#39;s so fun! Thank you for introducing me to Green Fairy Quilts! I now follow the blog! I just signed up to follow the blog. I get Green fairy newsletters. I follow Green Fairy Quilt&#39;s newsletter. I sucribed to the Green Fairy Quilts newsletter. I think the better question would be what do I not love in the store? The selection and prices are wonderful! I love Green Fairy ~ been getting their newsletter for awhile now! I am a Moda junkie! Love the Comma line! Her blog is great! And her quilting, gorgeous!! I love her blog and I follow it. If I had to pick just one favorite thing, it would be comma. I already get Green Fairy&#39;s newsletter! Great giveaway! I&#39;m subscribed to the Green Fairy Quilts newsletter. Thanks for the lovely giveaway. I&#39;d have to say that Snap Pop is my favorite thing in Judi&#39;s shop right now. I love those bright colors! I really like the 2wenty thr3e fat eighth bundle. Thanks! Just signed up for Judi&#39;s blog. Don&#39;t know why I didn&#39;t do it sooner! I subscribe to Green Fairy&#39;s newsletter!! I love checking out the Coming Soon pre-cuts!! I follow Judi&#39;s blog, thanks again! I love the Comma by Zen Chic layer cake. So pretty! It&#39;s really hard to pick one thing I really like on the page. Most of the stuff is so wonderful! I can&#39;t wait to get my hands on 2wenty Thr3e!! I love the cameras, tickets, and pink, yellow, and orange!! I follow Judy&#39;s blog. I am continuously amazed by her skills and incredible talent!! I follow Green Fairy in my Google Reader and have for quite some time now. I am a huge fan of FQ bundles. I found a number in her shop that I would love — 2wenty Thr3e, Comma, Odds &amp; Ends, Peak Hour, all the chevrons. So many great ones to choose from. Love the Field Notes charm pack. Thanks for the chance to win! I&#39;ve been following Green Fairy Quilts for quite some time and I love that she is so dedicated with her charity! I&#39;ve been subscribed to Green Fairy Quilts newsletter for a while! Right now, I&#39;m really into the bright colors. I stopped by her shop and really love the Snap Pop! I&#39;m totally in love with 2wenty Thr3e and Everlasting! I receive the Green Fairy Quilts Newsletter! Love it! Very generous giveaway! And the website is great. It is almost impossible to pick one item. Maybe 2twenty Thr3e fat quarter bundle. Thanks for the chance! I follow Green Fairy Quilts blog. Thanks again! Already follow the blog! Signed up for the newsletter, and LOVE the Twenty Thr3e bundle – think I see a baby quilt lurking there! I love Comma by Zen Chic-kinda digging all Moda fabric I have been seeing lately! I am really looking forward to Avalon from Fig Tree! The Posy Jelly Roll is awfully tempting too! I already subscribe to Green Fairy Quilts newsletter. Like you, I think her quilting is out of this world! I follow Judi&#39;s blog! It is awesome! I love Green Fairy Quilts and the way they display their fabric. I can see how each precut looks and I really appreciate that. I&#39;ve been getting their newsletter for awhile. I have Comma on my wish list from the first time I saw it. It&#39;s my kind of stuff. Thanks for a great giveaway. I follow the Green Fairy blog! Thanks for the chance! Green Fairy quilts carries lots of great (!) fabrics, but one that I am really looking forward to seeing next month is Simply Southwest. It will be something different from the other fabrics on the market right now. I&#39;m subscribed to the newsletter; thanks for the chance! I love the Snap Pop bundle (those colors)! I&#39;ve not seen it before today! I love all their precuts, especially the jelly rolls. I&#39;ve been getting GFC&#39;s newsletter for a long time. Love all their great fabrics. I eagerly await their weekend newsletter because Green Fairy truly does have fantastic sales. They are nice folks to boot! I could do with a Glamping charm pack or two! Spring House is my favorite collection but of course I love all of them. Great selection. I am a follower of Judi&#39;s blog. Love her quilting. I need to pick just one? Today i&#39;m going with Prisma Cats as I know my sister would love something made from it. Jubilee–so pretty! Thanks for the opportunity! I&#39;vebeen following Green Fairy for at least a year. I was able to get my layer cakes for my farmers wife quilt. I am a dedicated follower of Green Fairy, love Judi&#39;s blog. I get Green Fairy Quilts&#39; newsletter. What&#39;s not to love in their shop?? I love the Juggling Summer bundle. I&#39;ve been following Green Fairy Quilts for awhile now. I would dearly love a Fat Quarter Bundle of 2wenty Thr3e by Cosmo Cricket! I love Noteworthy by Sweetwater! Already get the Green Fairy newsletter and just signed up for Judi&#39;s blog. Ooh I LOVE Snap pop, so cute. But in the Green Fairy shop I love the Moda Layer Cake – Spring House by Stephanie Ryan. It&#39;s so nice and it keeping my spring dreams alive – c&#39;mon spring!! AND – One item I&#39;m wishing for from their shop right now is the Kissing Booth fat quarter set. Oh my, I love that fabric! AND – I follow Judi&#39;s blog. She&#39;s amazing! I&#39;m already receiving Green Fairy Quilts newsletter–love that shop! Thanks! I&#39;ve ordered often from Green Fairy Quilts–they have great products AND great customer service. Thanks! I love the Oink a Doodle Moo layer cake. It would make a great quilt for my grandson. I just signed up to receive the Green Fairy Quilts newsletter. Thanks for introducing me to this store. This will be a fun blog to follow, too–even though I&#39;ll never be able to quilt like Judi does–wow!! I&#39;m loving Comma, but 2wenty Thr3e has caught my eye over there, too. Prices look very reasonable as well. I&#39;m following Green Fairy Quilts Blog…can&#39;t wait to see her new posts. Yes I subscribe to her newsletter. I just subscribed to the Green Fairy Quilts blog. I&#39;ve been following Green Fairy quilts since sometime last spring, right now I am in lust with the Simply Color jelly rolls! Oh, and Cuzco! I want to do a woven quilt that I saw on the Moda Bake Shop page. I like the La Belle Fleur by French General. I follow the blog. Thank you for the great giveaway. I love Snap Pop. Gorgeous! What a great shop! Little Apples is very cute! Thanks for the giveaway! I love Comma, everything about it makes me love that line. I love the Pheasant Hill bundle. I like the Wee Wovens. I could see myself using those fat quarters in many types of quilts. I just started following your blog yesterday and I&#39;m so glad I did. I&#39;ve not heard of Green Fairy Quilts before today. Thank you for sharing. It&#39;s almost impossible to pick just one thing that I love at the store so I&#39;m going to kind of cheat and say that I love her &quot;Fat Quarter bundle Sale&quot;. Yay for sales!! I subscribe to Green Fairy&#39;s newsletter. I&#39;m with you I love Comma! I subscribe to Green Fairy Quilts newsletter! Love their awesome sales! I am a new follower of GFQ…WOW!!! What work!!! Thanks for enlightening me!! I am now signed up for the newsletter, too! i am in love with the FQ bundle, Comma by Zen Chic!!! I&#39;m already subscribed to her newsletter. Thanks. I&#39;m a follower of her blog too. THanks. Dancing in the Rain Batiks fat quarter bundle is my favorite in her shop. Thanks. My favorite at Judi&#39;s shop is the Comma fat quarter bundle. I have subscribed to the Green Fairy Quilts newsletter. Great chevron fabrics by Riley Blake on Green Fairy Quilts. I love Green Fairy Quilts. They have so many precut quilt kits. These are so nice, you can just grab a kit and know everything to in one place. No extra shopping, just grab and sew. I signed up for Judi&#39;s newsletter updates. Thanks for the giveaway. I&#39;ve seen a quilt made up of Audra&#39;s Iris Garden by Brannock and Patek and it was beautiful. I would choose the jelly roll of this fabric for a quilt for me. I aready follow Judi&#39;s blog. And, yes, Judi does beautiful quilting! already following GFQ&#39;s Blog 🙂 Thanks!!! can&#39;t wait for the Flats Layer Cakes in May2013 🙂 Thanks!! !